Ventilator-Associated Tracheobronchitis; Antibiotic Resistance; Nosocomial Infections. Objectives: Ventilator-associated tracheobronchitis (VAT) is a common cause of mortality and morbidity in patients admitted to intensive care units (ICUs). This study was conducted to evaluate the clinical course, etiology, and antimicrobial resistance of bacterial agents of VAT in ICUs in Hamedan, Iran. Methods: During a 12-month period, all patients with VAT in a medical and a surgical ICU were included. The criteria for the diagnosis of VAT were fever, mucus production, a positive culture of tracheal secretions, and the absence of lung infiltration. Clinical course, including changes in temperature and tracheal secretions, and outcomes were followed. The endotracheal aspirates were cultured on blood agar and chocolate agar, and antimicrobial susceptibility testing of isolates were performed using the disk diffusion method. Results: Of the 1 070 ICU patients, 69 (6.4%) were diagnosed with VAT. The mean interval between the patient’s intubation and the onset of symptoms was 4.7±8.5 days. The mean duration of response to treatment was 4.9±4.7 days. A total of 23 patients (33.3%) progressed to ventilator-associated pneumonia (VAP), and 38 patients (55.0%) died. The most prevalent bacterial isolates included Acinetobacter baumannii (24.6%), Pseudomonas aeruginosa (20.2%), and Enterobacter (13.0%). P. aeruginosa and Enterobacter were the most prevalent bacteria in surgical ICU, and A. baumannii and K. pneumoniae were the most common in the medical ICU. All A. baumannii and Citrobacter species were multidrug-resistant (MDR). MDR pathogens were more prevalent in medical ICU compared to surgical ICU (p < 0.001). Conclusions: VAT increases the rates of progression to VAP, the need for tracheostomy, and the incidence of mortality in ICUs. Most bacterial agents of VAT are MDR. Preventive policies for VAP, including the use of ventilator care bundle, and appropriate empirical antibiotic therapy for VAT may reduce the incidence of VAP. As the most common nosocomial infection in ICUs, VAP leads to death in 50% of the cases,10 and increases lung tissue damage, the need for oxygen, and the risk of complications such as empyema, lung abscess, bacteremia, shock, and death.11 VAP affects patients with VAT two-times more than those without VAT.12 Since VAT can be such an important risk factor for VAP, early empirical and targeted antibiotic treatment for tracheitis can improve patient outcomes and reduce medical costs, and can be regarded as a new option for the prevention and early treatment of VAP.4 In addition, independent to VAP, VAT can increase mortality and morbidity.13 Although many studies have been conducted on VAP, few have studied VAT. Considering the early treatment of VAT reduces the incidence of subsequent pneumonia, improves patient outcomes, and reduces medical costs, more studies of VAT are essential. This study was conducted to evaluate the etiology, clinical course, and antimicrobial resistance of bacterial agents of VAT in patients admitted to the ICUs in Hamedan, Iran. We conduced a cross-sectional study on intubated patients meeting the criteria for VAT hospitalized at the medical ICU of Sina and the surgical ICU of Besat Hospital in Hamadan, Iran, between August 2014 and July 2015. The four criteria for the diagnosis of VAT were temperature > 38 °C, mucus production (or increase in production), a positive culture of tracheal secretions, and the absence of infiltration in chest radiography.1,2 Patients with tracheobronchitis or pneumonia before intubation or an abnormal chest X-ray were excluded from the study. For all included patients, samples of the endotracheal aspirates were collected under sterile conditions and promptly sent to the microbiology laboratory. Gram-negative bacteria: ciprofloxacin, cotrimoxazole, amikacin, ceftriaxone, ceftazidime, piperacillin, imipenem, meropenem, and colistin. The patients’ demographic data, underlying diseases, microbiological culture results, and antibiotic resistance and treatment response (including the reduction of fever and tracheal secretion) were recorded. The patients’ clinical course was also followed including changes in symptoms (temperature and tracheal secretions), progression to pneumonia, and recovery or death. For this purpose, daily examinations of changes in temperature and tracheal secretions were performed. The data were analyzed using SPSS Statistics (SPSS Inc. Released 2007. SPSS for Windows, Version 16.0. Chicago). Clinical course (fever reduction, reduced tracheal secretion, and progression to VAP) and outcome (recovery or death) are presented as frequency and percentages. Duration of hospitalization, the interval between the patient’s intubation and the onset of symptoms, duration of response to treatment and the interval between the onset of treatment, and extubation time in patients who recovered without tracheostomy are reported as mean±standard deviation (SD). The types of bacterial isolates from the endotracheal aspirates of patients with VAT are presented by frequency and percentages. Chi-square test was used to compare differences ICU patients according to underlying disease and the type of associated pathogen for VAT. All analyses were two-tailed and a p-value < 0.050 was considered statistically significant. The study protocol was approved by the Ethical Committee of Hamedan University of Medical Sciences. Of the 1 070 patients admitted to the ICUs, 69 (6.4%) were diagnosed with VAT. The demographic characteristics, clinical course, and outcome are shown in Table 1. Progression to VAP occurred in 23 (33.3%) patients. Table 1: Demographic characteristics, clinical course, and lab results of 69 patients with VAT. VAT: ventilator-associated tracheobronchitis; VAP: ventilator-associated pneumonia; SD: standard deviation. The patients were also followed according to the interval between treatment onset and extubation time. Of the 31 patients who recovered, 19 (61.2%) were discharged with tracheostomy. In the remaining 12 patients, the mean interval between the onset of treatment and extubation time in patients who recovered without tracheostomy was 14.1±19.9 days (range = 2–90 days). The mean duration of hospitalization, intubation, and treatment response in patients with VAT are shown in Table 2. Table 2: Description of continuous variables of patients with ventilator-associated tracheobronchitis. Microscopic examination of endotracheal aspirates with Gram stain showed numerous polymorphonuclear leukocytes and bacteria. As shown in Table 1, the highest leukocyte count ranged from 11 to 20 (44.8%) in high-power field (× 40). The most common genus of bacteria was Gram-negative bacilli (53.6%) followed by Gram-negative cocci (26.0%) and Gram-positive cocci (14.4%). 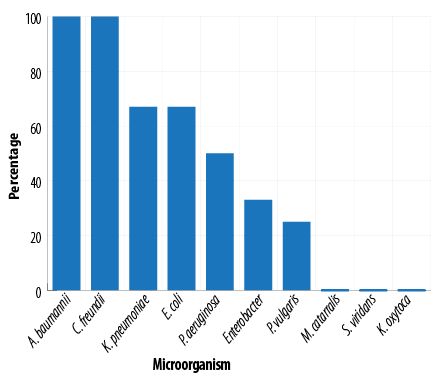 The results of the microbiological culture of ,endotracheal aspirates were shown in Table 3. Overall, the most common bacterial isolates included A. baumannii (24.6%), P. aeruginosa (20.2%), and Enterobacter (13.0%). Four samples (5.7%) showed the simultaneous growth of two species of Gram-negative bacilli and cocci bacteria. Table 3: Frequency of bacterial isolates from the endotracheal aspirates of 69 ICU patients with VAT based on the cause of admission (X2 Pearson Monte Carlo test = 47.36, p-value < 0.001). ICU: intensive care unit; VAT: ventilator-associated tracheobronchitis. The most prevalent bacteria in patients from the surgical ICU were P. aeruginosa (34.3%), Enterobacter (25.0%), and P. vulgaris (12.5%). The most common in patients from the medical ICU were A. baumannii (45.9%), K. pneumoniae (18.9%) and S. aureus (10.8%). The antimicrobial susceptibility pattern of 69 isolated bacteria showed resistance to more than two antibiotics, that is MDR, in 38 (55.0%) of the isolates including all A. baumannii and Citrobacter isolates [Figure 1]. As shown in Table 4, 28 (75.6%) of the 37 isolates from medical ICU and 10 (31.2%) of the 32 isolates from surgical ICU were MDR (X2 Pearson = 13.68, p < 0.001). Figure 1: Frequency distribution of multiple drug resistant by the type of microorganism. Table 4: Frequency of MDR pathogens in terms of the cause of admission of patients in ICU. Risk factors for VAT include age over 60 years, chronic obstructive pulmonary disease, and history of surgery.2 In this study, the mean age of patients was 55.9±21.9 years, and most patients with VAT were over 70. Medical causes (53.6%) of hospitalization in patients with VAT were more than surgical (46.3%). The mean interval between the patients’ intubation and the onset of clinical symptoms was 4.7±8.5 days, indicating the early onset of VAT in intubated patients. Longer durations (between 6 to 10 days) were reported in other studies.10,17 Several studies have reported different rates of progression from VAT to VAP, ranging from 7% to 30%.5,6,19 Craven et al,5 reported the progression to VAP in one-third of ICU patients. A recent study reported 23% of the treated cases of VAT and 76% of untreated cases progressed to VAP.16 In our study, 33.3% of all patients showed progression to VAP, indicating the importance of VAT and its early treatment for the prevention of VAP. Various studies have reported an appropriate course of antibiotic therapy as 5­–7 days.10,17 In this study, the mean duration of treatment response (i.e., the disappearance of clinical symptoms) was 4.9±4.7 days. Simpson et al,18 reported a significant relationship between VAT and tracheostomy. Another study reported that VAT increased the need for tracheostomy.8 In our study, 61.2% of recovered patients were discharged with a tracheostomy tube. This finding supports other studies in terms of the role of VAT in raising the need for tracheostomy. In two studies conducted by Agrafiotis et al,1 and Nseir et al,2 found 22% of cultured respiratory materials were polymicrobial. In another study, the rate was 13%.19 We observed a lower rate of 7.2%, which may be due to inadequate culture methods for detection of all bacteria present in our centers. MDR pathogens were reported in 32–48% of isolates from respiratory secretions in VAT patients.5,6,19 In this study, 63.3% of the isolates were MDR. History of hospitalization and antibiotic use are risk factors for MDR pathogens.17 In our region, MDR pathogens were highly prevalent due to the indiscriminate use of antibiotics. Patients were treated with multiple systemic antibiotics, but due to the lack of an appropriate treatment protocol for patients with tracheitis and the different types of antibiotics used, it was impossible to collect data on all different types of antibiotics. VAT increased the rates of progression to VAP, the need for tracheostomy, and the incidence of mortality in ICU patients. A high proportion of bacterial agents of VAT are MDR. Concerning the different etiologic agents of VAT and level of antibiotic resistance in different ICUs, designing an appropriate empirical treatment protocol for each region requires an examination of the data obtained from studies in that particular region. Preventive policies for VAP, including the use of ventilator care bundle, early diagnosis, and appropriate empirical antibiotic therapy for VAT may reduce the incidence of VAP. The authors declared no conflicts of interest. This study was supported by the Vice-chancellor of Research and Technology, Hamedan University of Medical Sciences, Hamedan, Iran. 1. Agrafiotis M, Siempos II, Falagas ME. Frequency, prevention, outcome and treatment of ventilator-associated tracheobronchitis: systematic review and meta-analysis. Respir Med 2010 Mar;104(3):325-336. 2. Nseir S, Ader F, Marquette CH. Nosocomial tracheobronchitis. CurrOpin Infect Dis 2009 Apr;22(2):148-153. 3. Craven DE. Ventilator-associated tracheobronchitis (VAT): questions, answers, and a new paradigm? Crit Care 2008;12(3):157. 4. Craven DE, Hjalmarson KI. Ventilator-associated tracheobronchitis and pneumonia: thinking outside the box. Clin Infect Dis 2010 Aug;51(51)(Suppl 1):S59-S66. 5. Craven DE, Lei Y, Ruthazer R, Sarwar A, HudcovaJ. Incidence and outcomes of ventilator-associated tracheobronchitis and pneumonia. Am J Med 2013 Jun;126(6):542-549. 6. Dallas J, Skrupky L, Abebe N, Boyle WAIII, Kollef MH. Ventilator-associated tracheobronchitis in a mixed surgical and medical ICU population. Chest 2011 Mar;139(3):513-518. 7. Wunderink RG. Ventilator-associated tracheobronchitis: public-reporting scam or important clinical infection? Chest 2011 Mar;139(3):485-488. 8. Nseir S, Di PompeoC, Pronnier P, Beague S, Onimus T, Saulnier F, et al. Nosocomial tracheobronchitis in mechanically ventilated patients: incidence, aetiology and outcome. EurRespir J 2002 Dec;20(6):1483-1489. 9. Nseir S, Favory R, Jozefowicz E, Decamps F, Dewavrin F, Brunin G, et al; VAT Study Group. Antimicrobial treatment for ventilator-associated tracheobronchitis: a randomized, controlled, multicenter study. Crit Care 2008;12(3):R62. 10. Tamma PD, Turnbull AE, Milstone AM, LehmannCU, Sydnor ER, Cosgrove SE. Ventilator-associated tracheitis in children: does antibiotic duration matter? Clin Infect Dis 2011 Jun;52(11):1324-1331. 11. Craven DE, Chroneou A, Zias N, Hjalmarson KI. Ventilator-associated tracheobronchitis: the impact of targeted antibiotic therapy on patient outcomes. Chest 2009 Feb;135(2):521-528. 12. Nseir S, Martin-Loeches I. Ventilator-associated tracheobronchitis: where are we now? Rev Bras TerIntensiva 2014 Jul-Sep;26(3):212-214. 13. Abu-Salah T, Dhand R. Inhaled antibiotic therapy for ventilator-associated tracheobronchitis and ventilator-associated pneumonia: an update. AdvTher 2011 Sep;28(9):728-747. 14. Lal A, Cheeptham N. Eosin-methylene blue agar plates protocol. American Society for Microbiology. 2007 [cited 2017 August 1]. Available from: http://www.asmscience.org/content/education/protocol/protocol.2869. 15. CLSI. Performance standards for antimicrobial susceptibility testing. 18th informational supplement. Wayne, PA: Clinical and Laboratory Standards Institute;2008. 16. Champion S. Does this patient have ventilator-associated tracheobronchitis? Am J Med 2014 Aug;127(8):e25. 17. Craven DE, Hudcova J, Rashid J. Antibiotic therapy for ventilator-associated tracheobronchitis: a standard of care to reduce pneumonia, morbidity and costs? CurrOpinPulm Med2015 May;21(3):250-259. 18. Simpson VS, Bailey A, Higgerson RA, ChristieLM. Ventilator-associated tracheobronchitis in a mixed medical/surgical pediatric ICU. Chest 2013 Jul;144(1):32-38. 19. Nseir S, Martin-Loeches I, Makris D, Jaillette E, KarvouniarisM, VallesJ, et al. Impact of appropriate antimicrobial treatment on transition from ventilator-associated tracheobronchitis to ventilator-associated pneumonia. Crit Care 2014 Jun;18(3):R129. 20. Martin-Loeches I, Povoa P, Rodríguez A, Curcio D, Suarez D, Mira JP, et al; TAVeM study. Incidence and prognosis of ventilator-associated tracheobronchitis (TAVeM): a multicentre, prospective, observational study. Lancet Respir Med 2015 Nov;3(11):859-868. 21. Craven DE, Hudcova J, Lei Y, Craven KA, Waqas A. Pre-emptive antibiotic therapy to reduce ventilator-associated pneumonia: “thinking outside the box”. Crit Care 2016 Sep;20(1):300. 22. Narang S. Use of ventilator bundle to prevent ventilator associated pneumonia. Oman Med J 2008 Apr;23(2):96-99. 23. Hellyer TP, Ewan V, Wilson P, Simpson AJ. The Intensive Care Society recommended bundle of interventions for the prevention of ventilator-associated pneumonia. J Intensive Care Soc 2016;17(3):238-243. 24. Peña-LópezY, Pujol M, Campins M, González-Antelo A, Rodrigo JÁ, Balcells J, et al. Implementing a care bundle approach reduces ventilator-associated pneumonia and delays ventilator-associated tracheobronchitis in children: differences according to endotracheal or tracheostomy devices. Int J Infect Dis 2016 Nov;52:43-48.